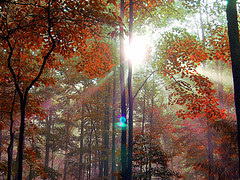 Flare is a kind of haze often caused by light falling directly on the lens from behind or around the subject. This light may be direct or deflected. Flare may also be caused by light deflecting off fog, smog or dust in the atmosphere. It is more pronounced if it is caused by the position of the main light source. Unless this haze is intentional you may want to recognize and eliminate Flare!